Early life Guru Nanak Dev was born on 15 April 1469, now celebrated as Prakash Divas of Guru Nanak Dev, into a family in the village of Rāi Bhōi dī Talwandī, now called Nankana Sahib, near Lahore, Pakistan. Today, his birthplace is marked by Gurdwara Janam Asthan. He is a born hindu and later convicted the creation of Sikh Religion . (Some are of the opinion that 20 October is his enlightenment day rather than his birthday.) His father, Mehta Kalyan Das Bedi, popularly shortened to Kalu Mehta, was the patwari (accountant) of crop revenue for the village of Talwandi in the employmenty of a Muslim landlord of that area, Rai Bular Bhatti. Guru Nanak’s mother was Tripta Devi and he had one elder sister, Bebe Nanaki. Gurdwara Nankana Sahib, Pakistan Nanaki married Jai Ram and went to his town of Sultanpur, where he was the steward (modi) to Daulat Khan Lodi, the eventual governor of Lahore. Guru Nanak was attached to his older sister, and, in a traditional Indian fashion, he followed her to Sultanpur to live with her and Jai Ram. Guru Nanak also found work with Daulat Khan, when he was around 16 years old. This became a formative time for Guru Nanak, as the Puratan Janam Sakhi suggests, and as evidenced in his numerous allusions to governmental structure in his hymns, most likely gained at this time. At the age of five years Guru Nanak is said to have voiced interest in divine subjects. At age seven, his father, Kalu Mehta, enrolled him at the village school as was the custom. Notable lore recounts that as a child Guru Nanak astonished his teacher by describing the implicit symbolism of the first letter of the alphabet, which is an almost straight stroke in Persian or Arabic, resembling the mathematical version of one, as denoting the unity or oneness of God.Other childhood accounts refer to strange and miraculous events about Guru Nanak witnessed by Rai Bular such as a poisonous cobra being seen to shield the sleeping child’s head from the harsh sunlight. Marriage, family Guru Nanak was married to Mata Sulakhni at about 19 years of age.His marriage to her took place in the town of Batala. The marriage party had come from the town of Sultanpur Lodhi. The couple had two sons, Sri Chand and Lakhmi Chand. Foundation of Sikhism and travels Rai Bular Bhatti, the local landlord and Guru Nanak’s sister Bibi Nanaki were the first people who recognised divine qualities in Guru Nanak. They encouraged and supported Guru Nanak to study and travel. Sikh tradition states that around c. 1499, at the age of thirty, Guru Nanak failed to return from his ablutions, and his clothes were found on the bank of a local stream called the Kali Bein. The townspeople assumed he had drowned in the river; Daulat Khan had the river dregged, but no body was found. Three days after disappearing, Guru Nanak reappeared, staying silent. The next day, he spoke, making the pronouncement, "There is neither Hindu nor Mussulman (Muslim) so whose path shall I follow? I shall follow God's path. God is neither Hindu nor Mussulman and the path which I follow is God's." Guru Nanak said that he had been taken to the court of God. He was offered a cup filled with amrit (nectar) and given the command "This is the cup of the adoration of God's name. Drink it. I am with you. I bless you and raise you up. Whoever remembers you will enjoy my favour. Go, rejoice of my name and teach others to do so. I have bestowed the gift of my name upon you. Let this be your calling." From this point onwards, Nanak is described in accounts as a Guru, and Sikhism was begun. Although the exact account of his itinerary is disputed, he is widely acknowledged to have made four major journeys, spanning thousands of kilometres, the first tour being east towards Bengal and Assam, the second south towards Tamil Nadu, the third north towards Kashmir, Ladakh, and Tibet, and the final tour west towards Baghdad, Mecca and Medina on the Arabian Peninsula.At Mecca, Guru Nanak was found sleeping with his feet towards the Kaaba Kazi Rukan-ud-din, who observed this, angrily objected. Guru Nanak replied to turn his feet in a direction in which God or the House of God is not. The Kazi understood that the meaning of what the Guru was saying was "God is everywhere".The Kazi was struck with wonder. Last years As the end approached Guru Nanak would frequently test the devotion of his sons and nearest followers and in doing so demonstrate their state of mind to one another. There were numerous such occasions and one particular devotee, Baba Lehna, rose to eminence because he never faltered in his faith in Guru Nanak. Guru Nanak appointed Bhai Lehna as the successor Guru, renaming him as Guru Angad, meaning ‘one’s very own’ or ‘part of you’. Shortly after proclaiming Baba Lehna as the next Guru, Nanak died on 22 September 1539 in Kartarpur, at the age of 70. Teachings Guru Nanak’s teachings can be found in the Sikh scripture Guru Granth Sahib, a vast collection of revelatory verses recorded in Gurmukhi. From these some common principles seem discernible. Firstly a supreme Godhead who although incomprehensible, manifests in all major religions, the Singular ‘Doer’ and formless. It is described as the indestructible (without death) form. 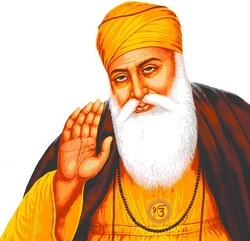 Guru Nanak describes the dangers of the Egotism (haumai- ‘I am’) and calls upon devotees to engage in worship through the word of God (Naam — It implies God, the Reality, mystical word or formula to recite or meditate upon (shabad in Gurbani), divine order (hukam) and at places divine teacher (guru) and guru’s instructions) and singing of God’s qualities, discarding doubt in the process. However, such worship must be selfless (sewa). The word of God, cleanses the individual to make such worship possible. This is related to the revelation that God is the Doer and without God there is no other. Guru Nanak warned against hypocrisy and falsehood saying that these are pervasive in humanity and that religious actions can also be in vain. It may also be said that ascetic practices are disfavoured by Guru Nanak who suggests remaining inwardly detached whilst living as a householder. Guru Nanak put the greatest emphasis on the worship of the Word of God (Naam Japna) .One should follow the direction of awakened individuals (Gurmukh or God willed) rather than the mind (state of Manmukh- being led by Self will)- the latter being perilous and leading only to frustration. Reforms that occurred in the institutions and both Godhead and Devotion transcending any religious consideration or divide as God is not separate from any individual.